About this site: The original all Sugar Glider anatomy website on the internet. (not to be confused with or associated with other sites) Most of the photographs on this site were taken by, and belong to BMXgirl (unless stated). NO unauthorized use of this site or it's contents are permitted. The models - Tiny Tony Cuddlebug, Bitty Mya Bugaloo, Buddy 'Goodboy' Bugaloo, Scooter 'Lil' Creme Boy' Bugaloo, and Amy 'Love' Bugaloo, are the owners of this sites webmaster. *All my 'kids' agree to pose for the purpose of education. With heavy heart - I lost my precious little Tony Oct. 10, 2003. :-( Tony was VERY important and loved by me and my family (still is)... he came from a very special place, and has left me with some of the most wonderful memories a person could ever have! I will ALWAYS remember my little 'Cuddlebug' and carry him in my heart and mind. Oct. 2, 2004 - My first and most precious baby, the little girl that started it all for me years ago... *crying* .... passed away quickly in my hands. :-( Mya was a little old lady, she came to me from a bad place (very bad). From the moment I brought her home, we had a very special bond. I cannot even decribe what Mya meant to me. She was priceless. She was what started my day off with a smile every morning. 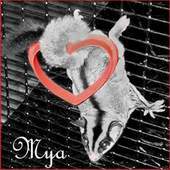 :-) Mya was the first Glider to be photographed in captivity carrying objects in her tail. (she had a serious obsession with a red plastic heart shaped cookie cutter...LOL.) She was the only Glider I have ever seen that would 'paint' pictures. (some friends and family have some of her 'artwork'). Mya has been in Calenders, in a book, made into quilts, made into woodburned art, t-shirts, websites, etc... (Her face is the logo here as well. She played a big role in developing this site.) She was very precious to me...a one of a kind. Everywhere I look I see her, it reminds me of how blessed I am to have been able to be Mya's family. She is remembered, and thought of, and missed, more than I could ever say.